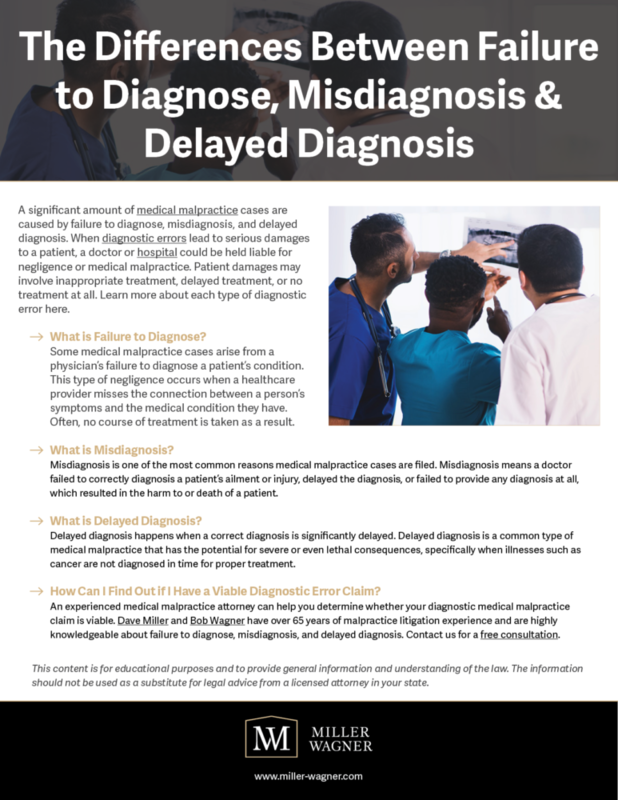 Negligent diagnostic errors can result in serious illness or other damages to patients. The medical malpractice lawyers at Miller & Wagner are here to help you understand your rights and guide you through the process of a diagnosis error claim. We have worked on countless medical malpractice cases and specialize in diagnostic negligence in Portland and the surrounding areas. Most medical malpractice litigation falls into one of two categories: mistakes in diagnosis or mistakes in treatment. In fact, almost 60 percent of medical negligence claims are a result of diagnostic errors. According to a research study by Johns Hopkins University, diagnosis errors also cause the most patient harm and lead to the highest amount of penalty payouts. Without a correct diagnosis, proper and timely treatment cannot occur. Diagnosis errors may also be caused by negligent administration of electronic health records (EHRs). Doctors and other healthcare providers are responsible for recording accurate patient data. Additionally, it is their duty to review all necessary medical information before diagnosing or treating their patients. If you suspect that misdiagnosis or late diagnosis of heart disease, cancer, stroke, or another serious medical condition played a role in the death or disability of someone in your family, get the answers and legal advice you need from a lawyer knowledgeable in diagnostic negligence. Contact Miller & Wagner in Portland for a free consultation with an experienced medical malpractice attorney. We represent medical malpractice clients throughout Oregon and Southwest Washington. Attorneys Dave Miller and Bob Wagner each have more than 30 years of trial experience pertaining to medical negligence claims. Much of their legal backgrounds include working to defend patients and their families in medical malpractice lawsuits. The relationships that the medical malpractice lawyers at Miller & Wagner have established with many Oregon and Southwest Washington physicians represent a powerful resource for our medical malpractice clients. The defendant in a misdiagnosis case may be a hospital, primary care physician, emergency room doctor, dermatologist, radiologist, oral surgeon, or another healthcare professional. Regardless of who was ultimately responsible for the missed opportunity for effective treatment and failure to provide the standard of care, our investigative medical malpractice team in Portland can get you the answers you need. A 2015 report by the National Academies of Sciences, Engineering, and Medicine indicates most people will face a significant diagnostic error in their lifetime. If you were misdiagnosed with a critical illness leading to unnecessary treatment, you might have a viable medical malpractice claim. In addition, if you suffered from severe damages due to delayed diagnosis or failure to diagnose, a diagnostic litigation lawyer can evaluate your case and help ensure you receive the compensation you deserve. Dave Miller and Bob Wagner both began their legal careers as defense attorneys for medical malpractice insurance companies. Their insight into the claim evaluation and investigation process from the defense side can give you an accurate idea of the strength and value of your diagnosis error case. The medical malpractice lawyers at Miller & Wagner also have access to a broad network of reputable medical experts and trusted professionals who will be an indispensable asset to your diagnostic claim. For additional information about filing a diagnosis error claim in Oregon or Southwest Washington, contact Miller & Wagner in Portland for a free consultation.